Based upon the ancient teachings of yoga, iRest is an evidence-based transformational practice that teaches physical, physiological and spiritual well-being. Classes run from 5pm until 6pm on Sunday’s in the Memorial Room (upstairs in the Northland Community Centre). Please bring along something to lie down on and a blanket to cover yourself with. No yoga experience necessary and no booking required, just turn up. 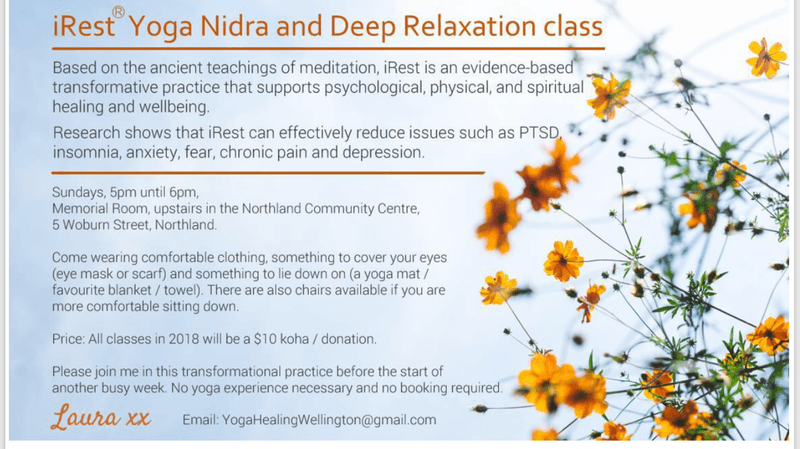 Contact: YogaHealingWellington@gmail.com for further information or to have your questions answered.